These seeds were originally bred by and came to us from famed organic seed breeder Frank Morton. 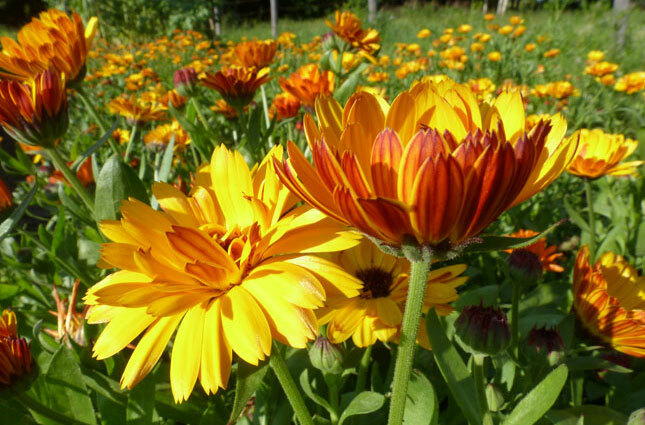 We grow Sunshine Flashback in mass plantings and scattered throughout our perennial beds where it is known for its pretty orange with burgundy backed double blooms. It has a prolonged bloom period starting in July and ending in mid-August. Calendula make lovely cut flowers. Direct sow in spring 6 mm (1/4 in) deep in sun or part shade. Space 15 cm (6 in) apart. Germinates in 5 - 15 days and grows to 30 - 45 cm (12 - 18 in) tall. Deadhead flowers if you don't want calendula to self-sow. We often add fresh and dried calendula petals to savoury dishes or herbal tea blends. When you pick the blossoms leave them outside for a few hours so that any critters have a chance to escape. We generally dry the petals or flower heads in a dehydrator at low heat or we preserve the intact flower heads in a jar covered with extra virgin olive oil and a lid.